When I think of Ava Gardner, it's not her Oscar-nominated performance in Mogambo nor her upbringing as a North Carolina sharecropper's daughter that come to mind. I also don't immediately think of her tumultuous marriage to Frank Sinatra. Rather, it's her penchant for bullfighters that inevitably pops into my head before all of her other claims to fame. I don't know why, but there it is. It was the bullfighter thing that I thought of when I first saw photos of Gardner's George Stacey-decorated Madrid residence in Katherine Tweed's 1964 book, The Finest Rooms, and, more recently, in Maureen Footer's enjoyable and informative monograph, George Stacey and the Creation of American Chic. (If, like me, you gravitate to books about design greats, then you should consider adding Footer's book to your library.) One might have expected a home that was overtly sensual, much like the sultry characters that Gardner so often played. And yet, her home was in reality rather prim and proper thanks to an attractive assortment of refined antiques, sumptuous fabrics, and traditional paintings. 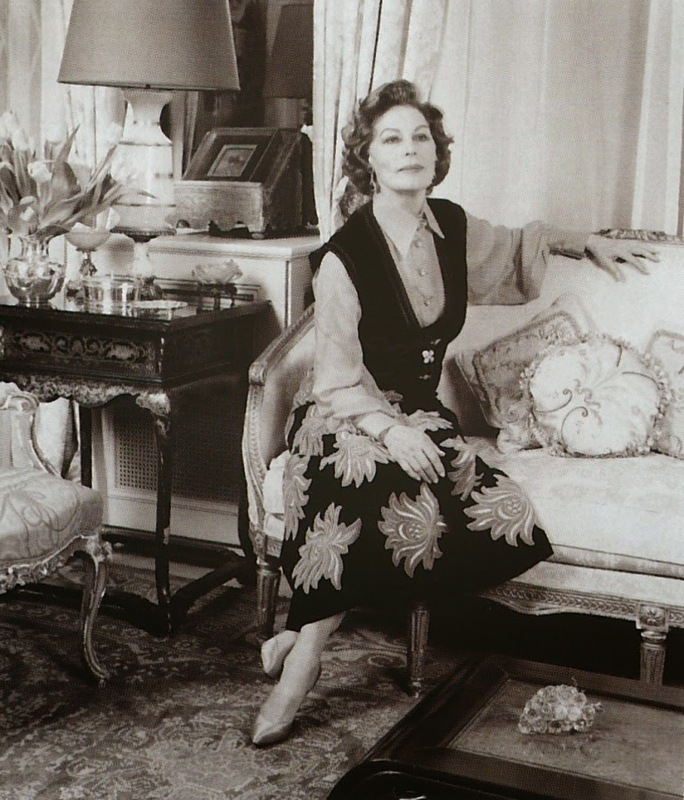 In her later years, Gardner quit Madrid for London, where she eventually took up residence in a Knightsbridge flat. According to Footer, Stacey decorated both a house and an apartment in London for the actress, although the Architectural Digest issue from which the photos below were taken make no mention of Stacey. Nevertheless, Gardner's London flat, like her Madrid apartment, was a model of elegant- and some might say aesthetically cautious- decor. 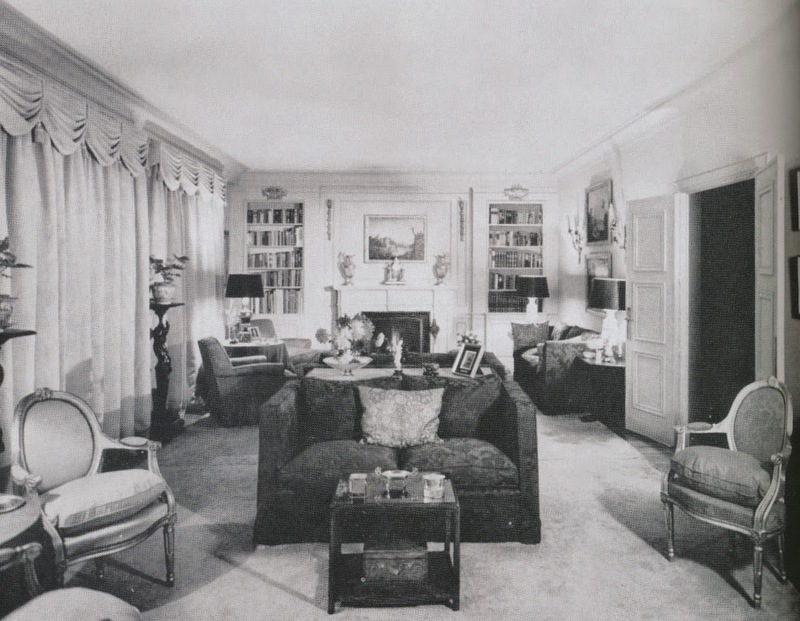 But for all of the home's play-it-safe furnishings, the residence wasn't lacking in glamour. It was a fitting last home for a woman whose earthy good-looks and, at times, earthier lifestyle helped to make her a true Hollywood star. 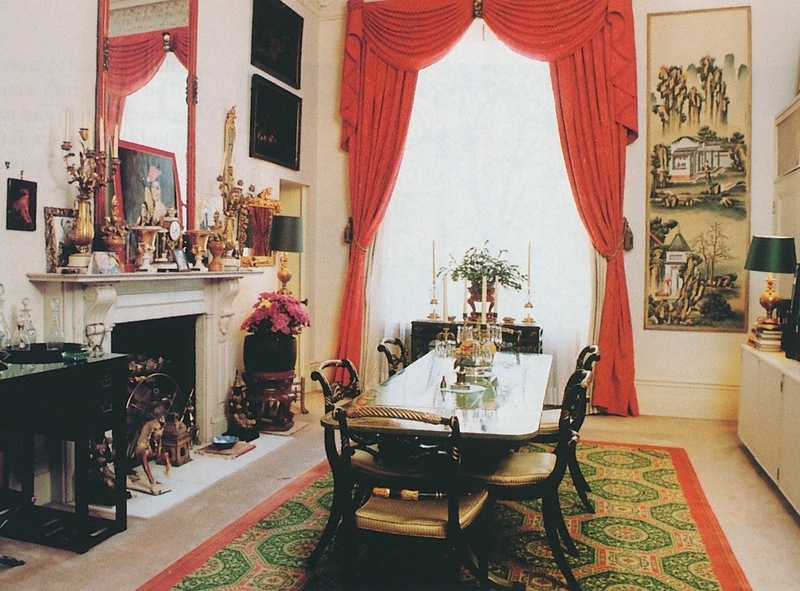 All photos from Architectural Digest, April 1992, with the exception of photos #2 and #3, which appear in George Stacey and the Creation of American Chic. LOVE the black & white toile! My mother used that in a living room in the early 1960's - it was quite smart. I'd love to see toile make a come-back! I love the shots of red and green. The black and white photos do not do the rooms justice. Her London house had great appeal, to my way of thinking. the Victoria & Albert Museum. The perfect balance of art and religion! Her Stacey designed rooms have a kind of quiet flair. Those brackets and pots on mirrored walls, the chinese wallpaper, the 'signature' Stacey pairing of tomato red and mossy green---and then that charming bedroom/sitting room in which the 2 printed cottons take the edge off what might have been cold formality----well, it might not add up to something exactly cozy, but I'd take it in a heartbeat. This kind of "aesthetically cautious" design sure works for me! Looking at these rooms in the context of their time, I see a daring choice of colours and bold patterned fabric. Check out that dynamic carpet under the dining table. This is where I think the real Ms. Gardner reveals itself. This is classic with a twist. Like Mr. Worthington (pretty please start your own blog, Mr. Worthington, you have many fans and so much knowledge to share!) 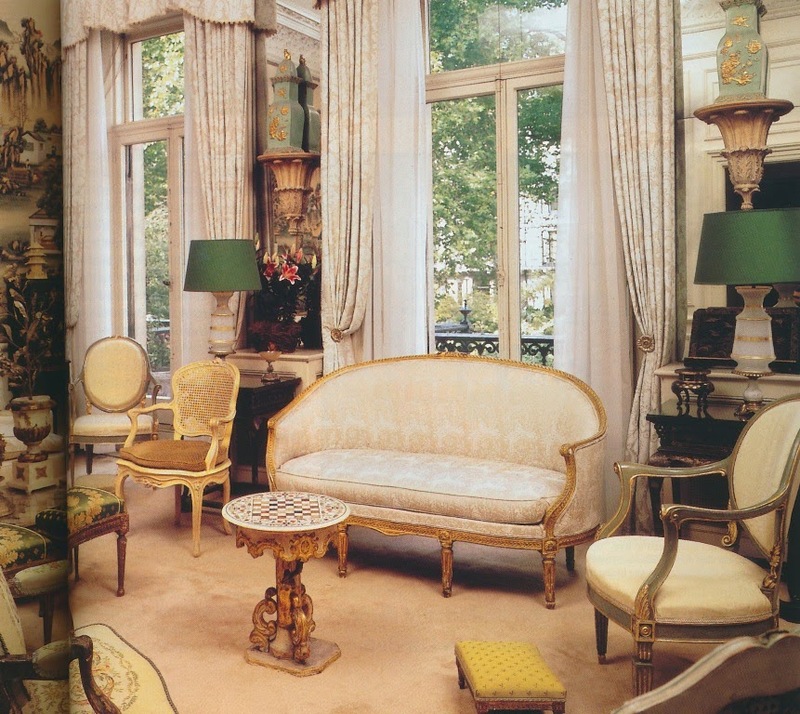 I find these rooms timeless and appealing despite their formality. A little tweaking with curl up kind of seating would ratchet down the slight chill factor. Thanks for this post- I'll be scouting for more Stacey rooms now! 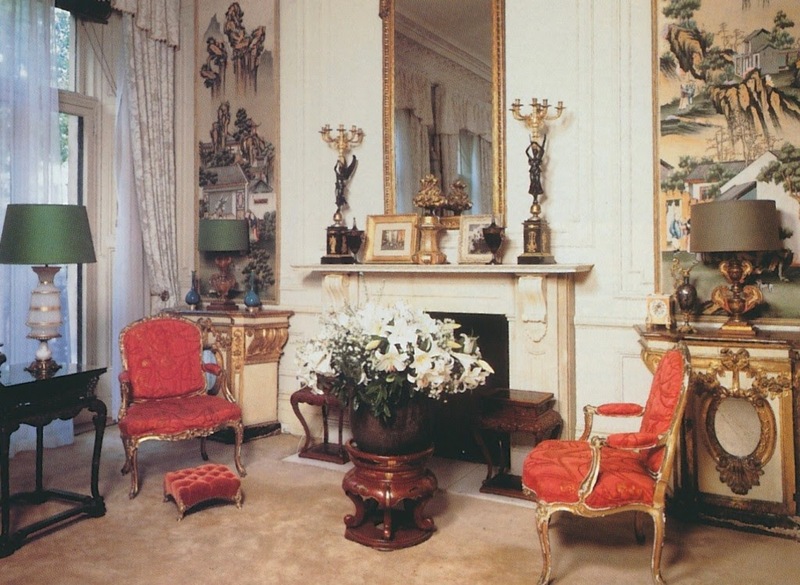 George Stacey created timeless rooms. 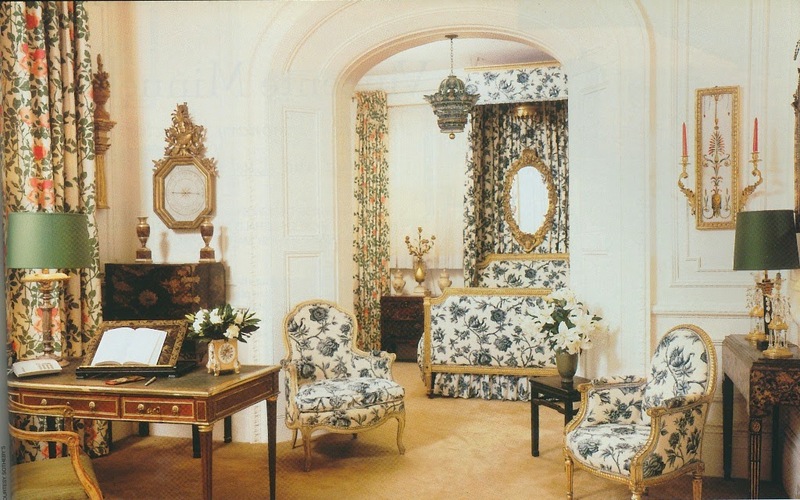 Adding a superb area rug in the black and white toile room might make a huge difference, as I do love the toile. The article from which the London photos were taken mentioned designer Michael Szell, who was listed only as a neighbor and good friend. Although the article does not make mention of this home's designer, I can't help but wonder if Szell played a role in the decor. I see some of his signature bold touches in these rooms. Do you mean to say that we're crediting Mr Stacey with the work of Michael Szell? The London flat has certainly got more printed materials than the archetypical Stacey room, which was indeed characteristic of Szell's work. But the whole mood is infinitely more restrained than anything we'd associate with Michael Szell. Perhaps there was a layering of Stacey's work and Szell's? The end result is authoritative, no matter what the attribution. Toby, The AD article makes no mention of Stacey. However, the article does quote Szell, who is referred to as Gardner's next-door neighbor and friend. Szell's remarks were limited to Gardner's style. It does make me wonder if Gardner might have consulted Szell on a few abrics, furnishings, etc. Perhaps Stacey laid the foundation for the flat's decor, and Szell made a few contributions in later years. Love the colored lampshades throughout and just enough use of pairs/symmetry. Nice post! My favorite thing (besides the lady herself) is the green lampshades. Beautiful and dramatic! Thanks for sharing! All the other great stars, beginning with Elizabeth Taylor, thought Ava was the most beautiful of them all. I agree. 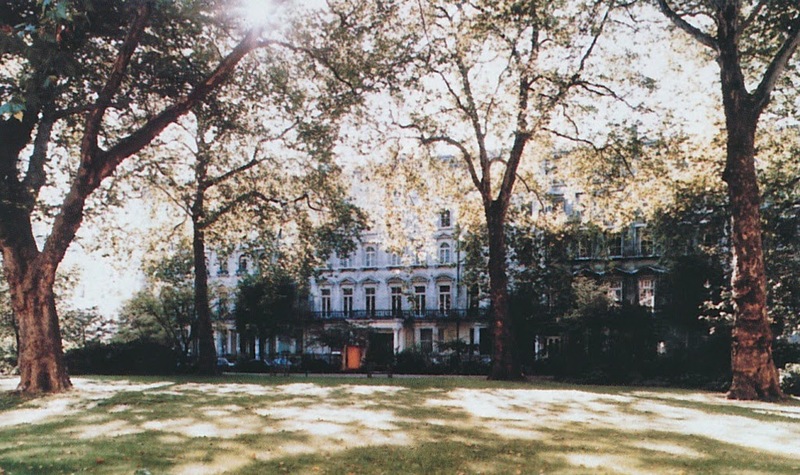 i missed seeing the most beautiful star of them all by 2 months when i landed living in the next door building ....was it 36 or 34 Ennismore gardens in early spring of 1990.... but she was ill for a long time so i wouldn't have.